Derma Sciences 84133 DuSoft Non-Woven 3 x 3 in. 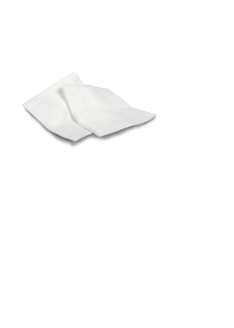 Sponges are versatile sponges that are ideal for either wound cleansing or as a secondary wound dressing. It offers 4-ply construction and is made out of a rayon and polyester blend that makes for high absorbency and fast wicking action. As a secondary wound dressing, the gauze sponge will manage wound exudate to prevent maceration. The non-woven design will also be gentle to the wound bed and not disturb newly formed granulation tissue. 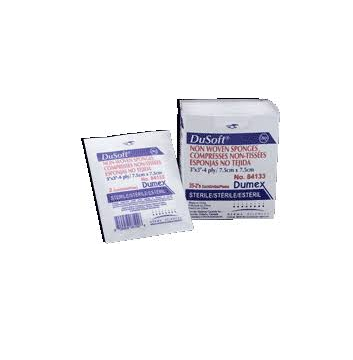 The DuSoft® sponges come two in a pack in a box of 25 packs. Purchase a box for home first aid use or a case of 48 boxes to stock a medical facility. You may be interested in other sizes by Derma Sciences such as the 2 x 2 inch sterile sponge.